Tying the knot can take on a couple of meanings at weddings - one is getting hitched, the other can actually be tying a real knot! 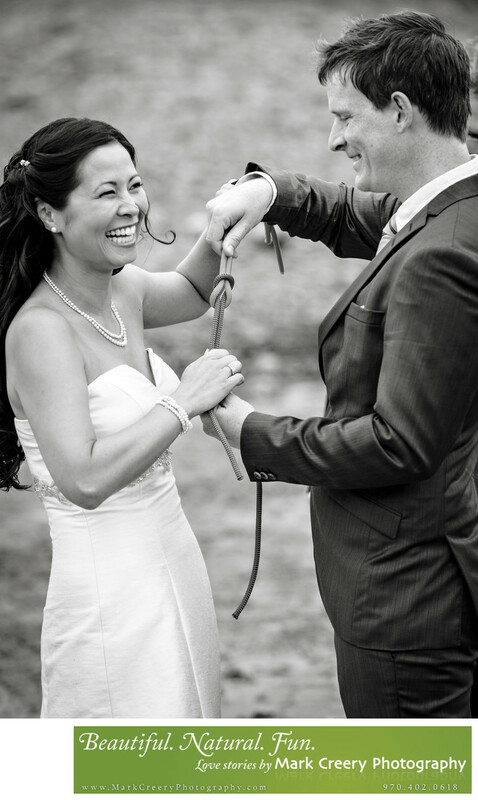 It is a symbolic tradition that is done with two cords - each representing the bride and groom as individuals. Then as the couple bring the cords together it symbolizes their union as man and wife. The knot then represents your future life together - strong and secure, getting stronger and unbreakable. It's a powerful metaphor for marriage! Windsong Estate is one of the newest event centers in Northern Colorado and a perfect place to tie the knot. Because it is away from town you have a wild party and no one around will notice. It has a nice manicured ceremony location with views of the mountains. There are getting ready suites available on site. The modern interior gives lots of natural light and options for reception set-ups. Windsong Estate is located in Fort Collins, Colorado. Contact: Jackie Matsuda, (970) 686-9690, Jackie@WindsongEstate.com. Location: 2901 Saddler Blvd, Fort Collins, CO 80524.